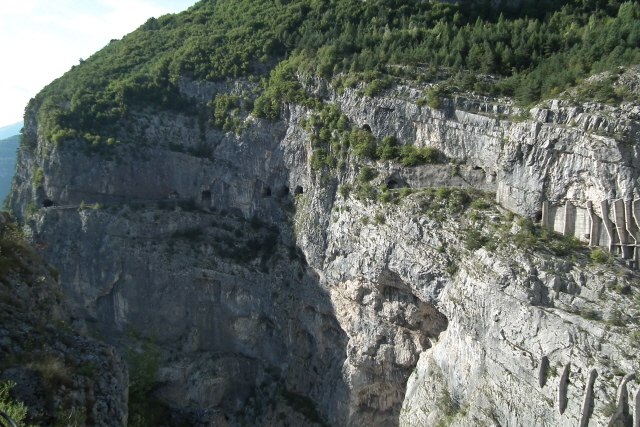 This is a somewhat more obscure dark site, in northern Italy, but nonetheless the site of a major tragedy – partly natural, partly man- made – when in 1963 a landslide, which could have been foreseen, displaced the water in a reservoir which then washed over the high concrete dam supposed to hold it in and carried on down the valley in a huge wave washing away the town of Longarone and killing ca. 2000. The dam, which – ironically – survived the disaster virtually intact, can be visited today, including guided tours of the crest. There is also a small visitor centre. 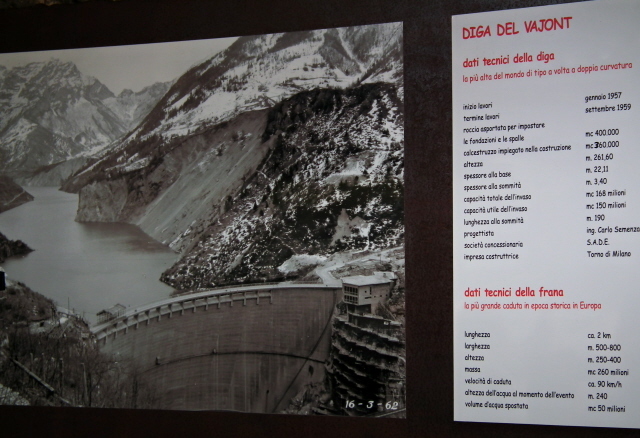 More background info: The story of the Vajont disaster is roughly this: in the late 1950s a new dam was built in a deep gorge in the northern Italian mountains (on the southern edges of the Dolomites) for hydroelectric power generation. In fact, at 262 metres (860 feet) tall, it was at the time of completion the highest such structure in the world ... and still ranks among the top-five – in short: it was a highly ambitious prestige project. However, the design was flawed – not that of the dam itself, which was a brilliant technological feat. But: the mountainside on one bank of the reservoir, Monte Toc, was unstable. This could have been considered in the planning but wasn't – or at least not sufficiently. Several smaller landslides gave ample warning of the looming catastrophe. These warnings were picked up and reported, but the authorities decided to ignore them and rather suppressed the reporting. On the night of 9 October 1963, disaster hit. Big time. After heavy rains, the whole destabilized mountainside to the east collapsed rapidly into the artificial lake, thus displacing millions of tons of its water in an instant. I won't commit to any exact figures here, because those stated in the sources I could find varied so widely (usually between 30 and 250 metres or 100 and 820 feet), but it sure was a massive wall of water that was set in motion. This massive tsunami then over-topped the dam … rather than making it collapse – i.e. the dam itself survived! Beyond the dam the water formed a huge flood wave racing down the valley and washing away villages and the small town of Longarone just to the west of the gorge. In total, the disaster claimed the lives of some 2000 people. Most of them had been fast asleep in their beds when the flood wave struck. Villages at the other end of the lake were also affected by the secondary landslide-induced flood wave pushing up the lake to the east. This includes in particular Erto, whose lower lying old town sustained some damage that can still be seen. The inhabitants of those doomed settlements had largely been kept in the dark about what imminent danger was looming above their heads just up the valley – and what protests there had been were mostly ignored. In that way, the Vajont catastrophe was a political disaster too, not just one of engineering, let alone merely a freak natural accident. The latter was how the authorities indeed attempted to portray the disaster in the immediate aftermath. 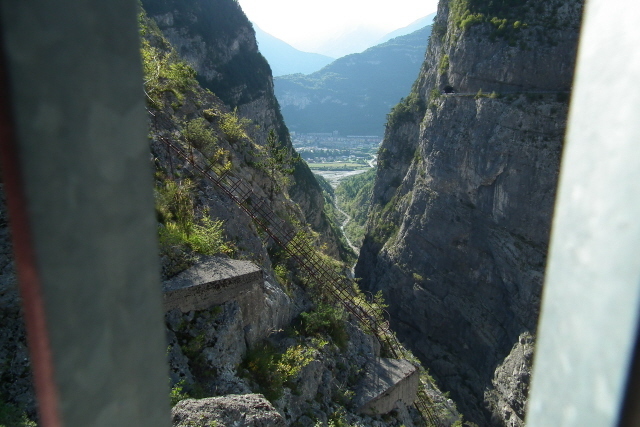 However, the Vajont/Longarone catastrophe is now regarded as one of the worst man-made disasters ever. It took a long time for it to be openly recognized for what it was. For the first few decades it was almost a taboo subject – but then from the late 1990s it was picked up in the media again in the form of books, a film, TV documentaries and a kind of reality theatre play. Thus brought back into public consciousness the site itself also became something of pilgrimage site – and a (dark!) tourist attraction. 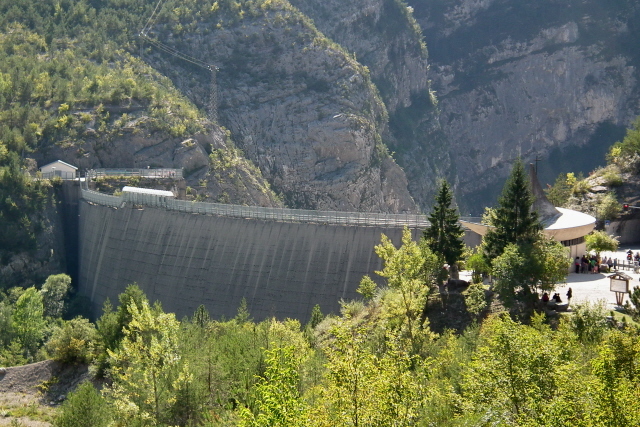 The dam itself, which amazingly survived the enormous forces of the water almost without a scratch, still stands today. The control building to the side of it, however, had also been washed away killing all the workers who were on shift at the time. The dam forms the centre of attention today, naturally. There are even guided tours of the crest – see below. 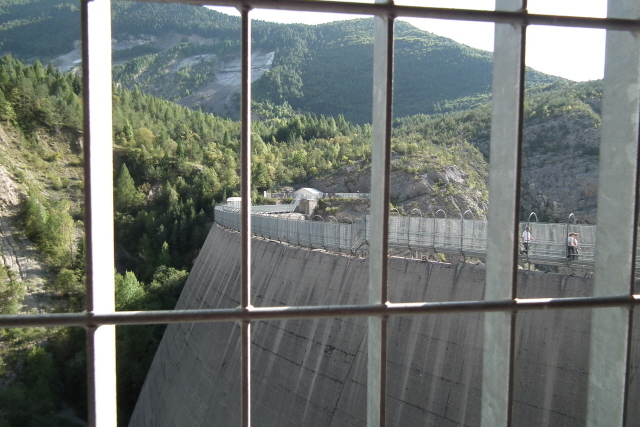 What there is to see: You can see the top part of the remaining dam even from the (rebuilt) town of Longarone. To get closer to the site take the road that winds up into the mountainside to the east (see below). This will eventually become a tunnel through the mountainside going straight past the northern end of the dam. You can catch a brief glimpse of the dam through "window" holes in the rock – and there are memorial plaques in one of these niches. 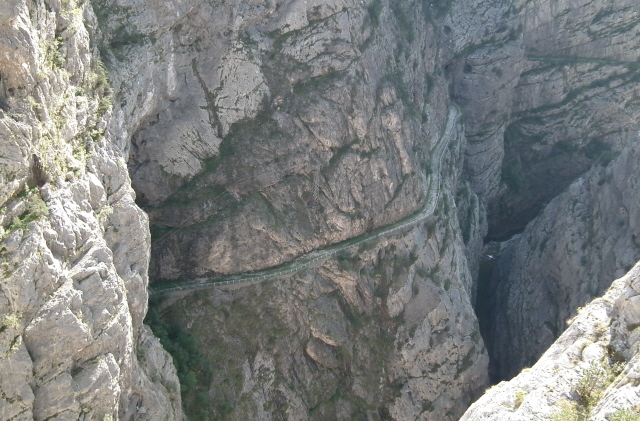 Note that you are not allowed to stop along this route, or in the niches, and shouldn't really walk it either – though some people do … there can be a lot of traffic on the road, so care has to be taken when attempting this! 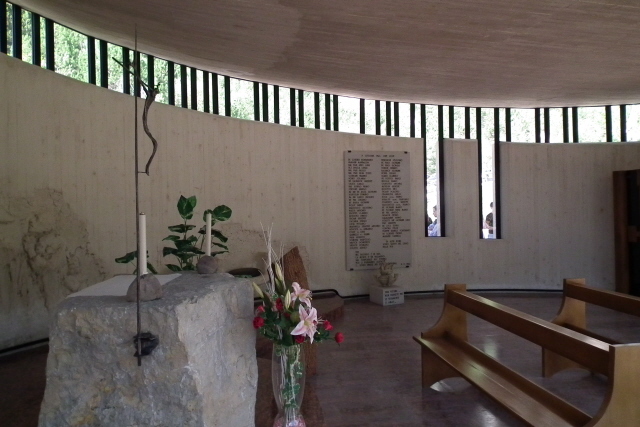 Just beyond the tunnel exit and the northern edge of the dam stands a small memorial chapel, surrounded by more memorial plaques and markers and an information panel (in Italian only). A bit further up the road is a pay-and-display car park from where you can walk back down to the chapel and the dam. At the car park there is also a seasonal visitor centre hut – and it's from here that guided tours of the crest of the dam are offered. 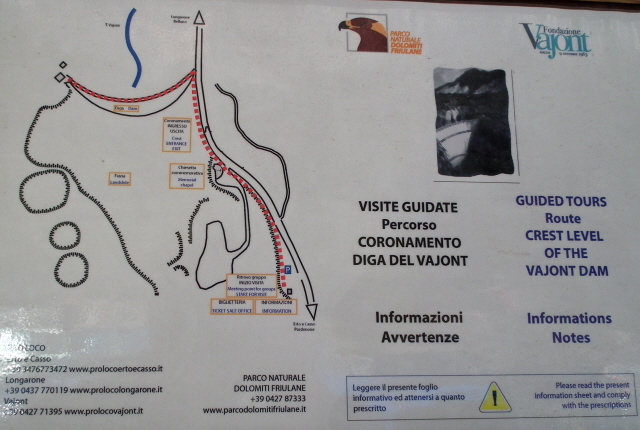 Some of the information given at the centre is in English as well as Italian, but the guided tour itself is in Italian only. I'd still recommend going on it even if you don't understand any Italian. If you’ve read the section above you will already know most of the background story anyway – the main attraction of the tour is that it gives you access to the stunning views from the top of the dam! The guide I had actually did know English quite well – and suggested himself that I rather concentrate on the views and on taking pictures while on the dam and ask any questions I might have after the tour proper. And this I did. Thus I learned, for instance, that up to 600 people a day take these tours in season, usually in groups of 20 (at peak times even 40). So it's quite a touristy affair. Once you've listened to the introductory talk by the memorial church, the group is led past a person collecting tickets. This is to ensure that only visitors who have paid for the guided tour are let through – i.e. there's no access without the tour! At the beginning of the metal walkway that leads over the crest of the dam there are some charts with mostly technological data about the dam. Again, this is all in Italian only, but to a good degree transparent enough for a reasonable grasp of the crucial data, even if you don’t know the language. Then you can cross the dam itself. The views are indeed priceless. But not for vertigo-sufferers! On the walk you first go round the front of the dam, where there's no longer a lake, just land that is now overgrown with gentle pasture and sparse forest. There's also a path down to what appears to be the base of the dam on this side. But of course the landslide material has filled up the valley to more than half the actual height of the dam so that from this side it looks far less massive. 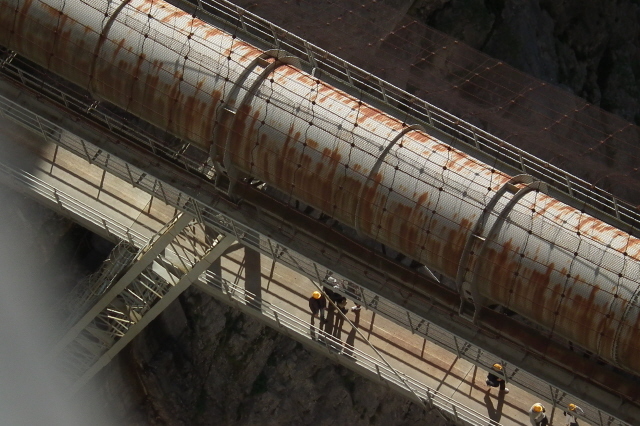 This approach thus doesn't quite prepare you for then seeing the other side behind the dam – a 262 metre (860 feet) deep abyss. 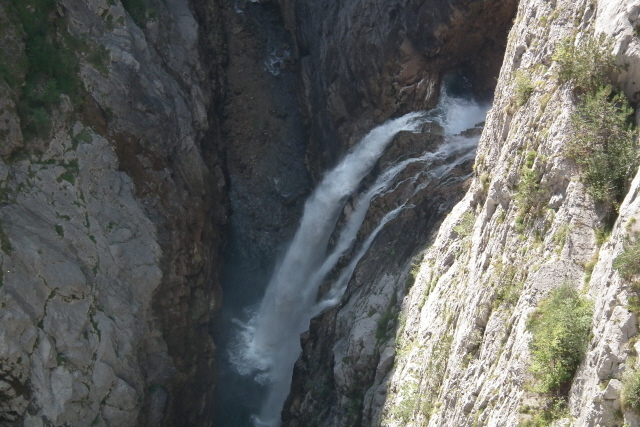 The sight is further heightened by the artificial waterfall – a long gushing tail of water coming out of the mountainside, where the waters of the dammed gorge's river/lake are drained off. It's a two-tier waterfall, first crashing onto a rock promontory then down into the bottom of the gorge – deep, deep down in the dark. A smaller trickle is also discharged from the opposite side. 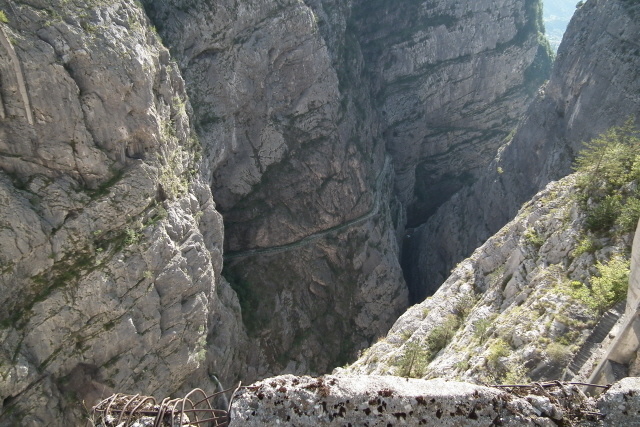 About half of the distance down from the crest of the dam, the "Ponte Tubo", or pipe bridge, together with a footbridge right below the massive tube span the gorge. It's quite a sight to behold from above, and it must be even more dramatic to actually stand on it. I did spot a few people on the footbridge – but they were authorized personnel (complete with telltale yellow hard hats). The general public, so I was told by the guide, is only allowed access to this once a year, namely on the last Sunday in September, when there's an official "Vajont run". This starts somewhere from down the gorge near Longarone and goes all the way up an access pass winding its way along the side of the gorge and through a series of tunnels and eventually emerges at the bridge and into the caverns of the former hydroelectric plant inside the mountain. If you've seen pictures on the Internet of visitors walking across the bridge (or photos taken from the approach path or inside the caverns), then they will most likely have been taken on such an occasion. 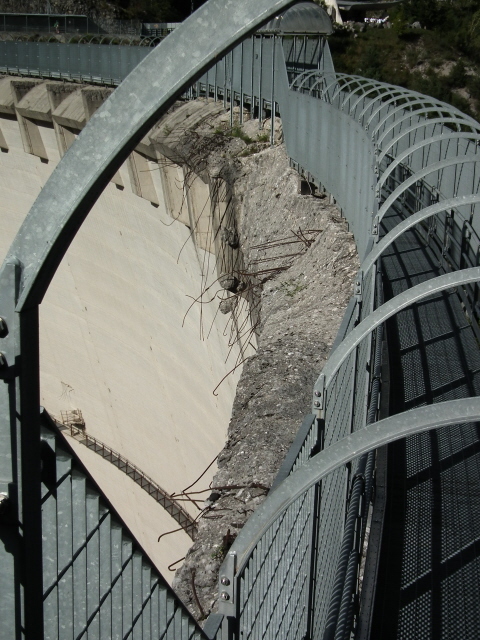 The rest of the year, those lower parts of the Vajont structure, bridge and tunnel system is out of bounds for normal visitors. 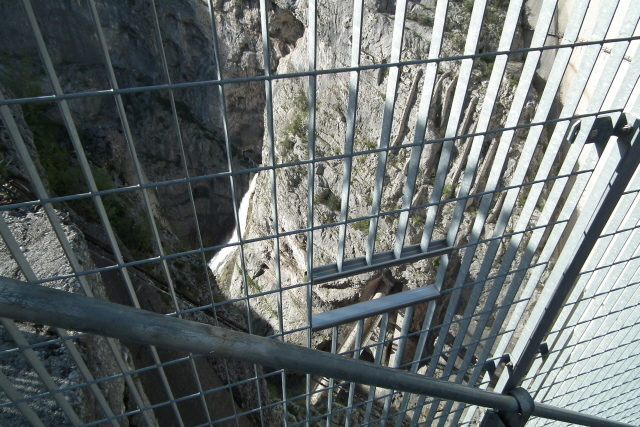 Apparently this is primarily for safety reasons, as the tunnels and cliff-side walkways are decaying. Only in the run-up to the Vajont run day are there special inspections to make the tunnels and walkways safe for participants, so I was informed by my guide. I'm anything but the marathon-runner type, but maybe one day I'll have to come back for this on that once-a-year special event. I wouldn't mind coming last, I'm only interested in the views. 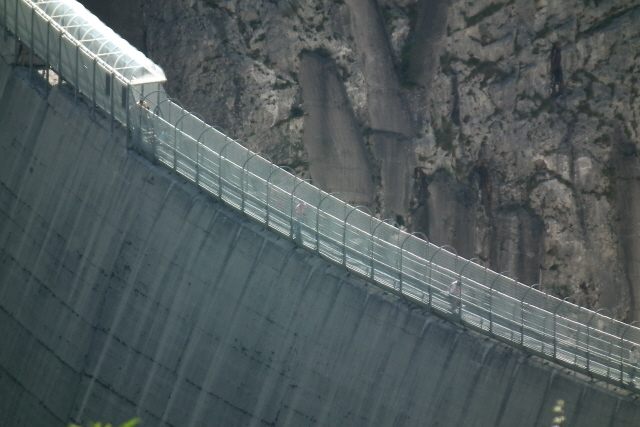 At the other end of the dam, the walkway opens into a platform. From here, further spectacular views can be had down the gorge and of the back of the dam, especially when the light is good and the sun shines on it in the afternoon. The front of the dam, on the other hand, will look better in the morning. This is kind of important to remember for photography in particular. Along the viewing platform's fence there are more charts- and text-panels. Interestingly these not only come with English translations (! ), they also outline suggestions for a much more elaborate commodifcation of the site – even including a glass lift that would go down to the bottom of the dam/gorge. However, these are apparently only the result of a university student's project, as my guide explained, and are extremely unlikely ever to materialize in reality, unfortunately. It's a shame, but it's the same old story: who would pay for all this? Indeed, it would require a much larger number of (moneyed) tourists to make that sort of thing possible. And such mass draw could in turn ruin the atmosphere of the place… Still, more could indeed be made of this site. Apart from the dam itself it is also worth exploring some of the viewing points. Most significantly, you can drive up to the little village of Casso which nestles high up in the steep mountainside to the north of the dam. 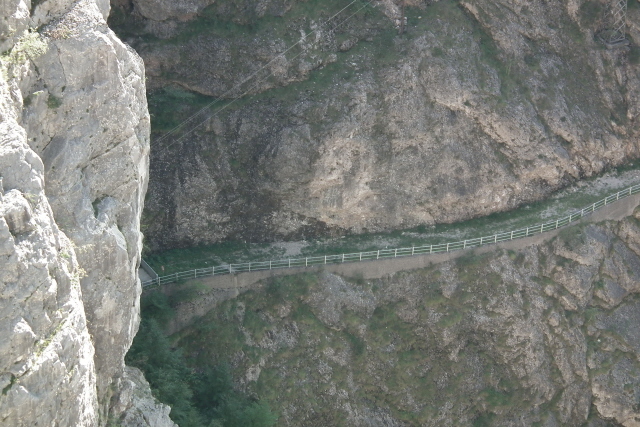 The first wall of displaced water after the landslide reached as far up as here – which gives you an impression of the dimensions of the forces at play back then. It is also from here that you still get the best view of the enormous scar the landslide left on Monte Toc and of all the "new" land it created down in the valley. This new land is these days also crossed by a couple of small roads. One leads to a kind of picnic spot, from where you can walk towards yet more viewpoints from where to see the dam. Remnants of the workers' "village" that was wiped out by the landslide are said to be discernible too. Further up the road leading to the little village of Pineda you can best see what remains of the dam's reservoir, still called Lago del Vajont. A few miles up the road that leads along the northern side of this lake takes you to the larger village of Erto, which was also partly damaged due to the flood wave that went in the other direction, to the east and up the northern flanks of the mountainside opposite Monte Toc. A new village was rebuilt higher up the hillside – but below it the historic old town, "centro storico", still features ruins of buildings the disaster left behind. Other parts of the old town have been restored and are quite atmospheric. Access and costs: by car on minor mountain roads, but not difficult to find, free to view from a distance, but fees are charged for tours and the visitor centre. Details: To get right up to the dam you need your own vehicle – be it a car or, very popular here, a motorcycle. Alternatively hire a taxi from Longarone. From the main trunk road through the town of Longarone (SS51) you need to take the road numbered SP251 (later SS251) branching off east – it is these days clearly signposted "Diga del Vajont". 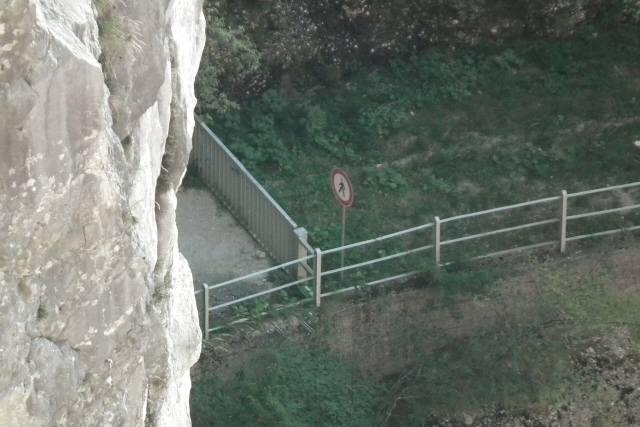 Following those sign you will eventually get to the approach tunnel at the top of the gorge. Traffic lights control the alternating one-way traffic flow here. From the tunnel you will already catch a few glimpses of the dam to the right – as well as of some memorial plaques towards the end of the tunnel. No stopping anywhere along this route though! After exiting the tunnel carry on past the memorial church and try to find a space in the pay-and-display car park a couple of hundred yards further east. Charges are hourly – one hour may be tight, but the wardens know that if you're on a guided tour you might be a bit late returning to your car and are said to be lenient – to be on the safe side though it's probably better go for two hours straight away. If this car park is full, there are more parking spaces further up the road still – even free ones – but then you'd need to walk all the way back down the road (no proper pavement! ), so take care with the traffic. At the "official" car park there's a small hut with lots of information panels on and next to it. This is also where the guided tours of the crest of the dam start. Tours last about 40-45 minutes and cost ca. 5 EUR per head. Note, however, that these are conducted in season only, weekends only in July, daily in August, and Sundays only in September (at least these were the arrangements posted for 2010). Tours start on the hour between 10 a.m. and 5 p.m. – when I was there, however, additional tours took place in between those times too as it was a sunny and hence busy mid-September Sunday. The guided tour will all be in Italian only, but even if you don't know a word of Italian you can still go on the tour simply for the views. Your guide may offer to give you separate explanations in English after the tour. My guide's English was in fact rather good, but apparently the length of the tour does not allow for it being conducted bilingually as such. Or maybe the demand by non-Italians is just too low for such extra language provision. The tour will take you to the memorial chapel and then along the metal walkway that has been constructed all the way along the crest of the dam, leading to a viewing platform at the opposite end. Every now and again, there are gaps in the metal fence which are just about big enough for getting a camera through. (Keep it strapped on to yourself, though! I saw some people nearly dropping theirs into the abyss.). 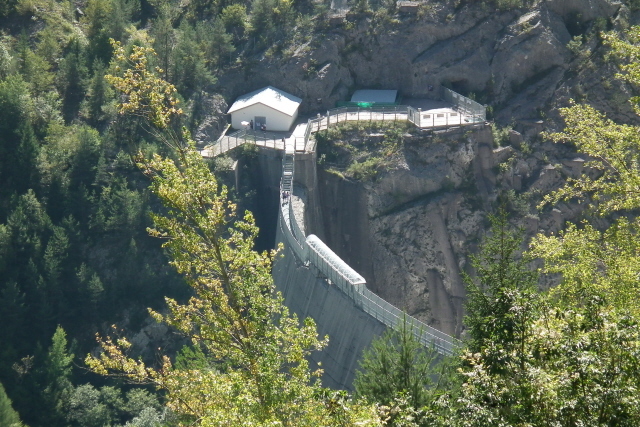 The gorge is best viewed from the first stretch of the walkway to the north – whereas the top tier of the artificial draining waterfall as well as the back of the dam itself are best seen from the viewing platform. Without going on the guided tour you'd have to make do with viewing the dam from a distance. The closest you can get is, naturally, right by the memorial chapel, behind which the metal walkway over the crest begins. 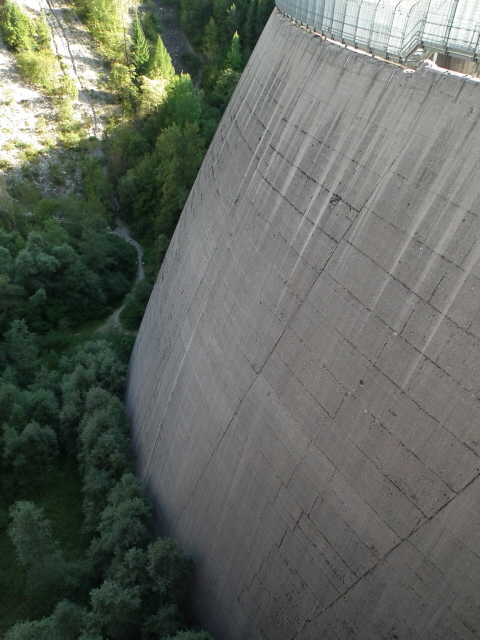 You could also walk down to the bottom of the dam. Well, that's actually the top of the landslide heap – the dam itself continues underground for at least twice as deep as its remaining height at the front. But you'd only see a curved grey mass of concrete from down there. Better views can be had from viewpoints further up, of which there are a few. A particularly good view can be had from the village of Casso high above the dam and the valley. The road branches off to the left just a short distance east from the car park(s) by the dam. It's a steep road with several hairpin bends, so it's only suitable for regular-sized cars, but no caravans or the like. 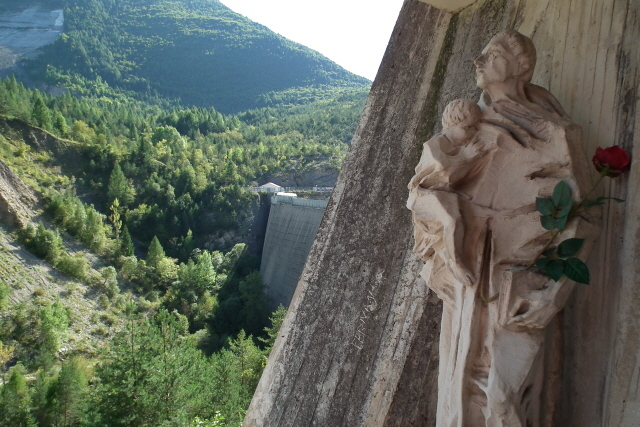 Once at the edge of the village find a parking space and look for a good point to look down towards the dam – such as from back by the little wooden memorial by the road. From up here you're almost directly above it, but you can't see much of the gorge behind it (it's too steep). However, this is the best viewpoint from which to appreciate the scale of the landslide that caused the disaster! The still grey scar on Monte Toc opposite is indeed massive. 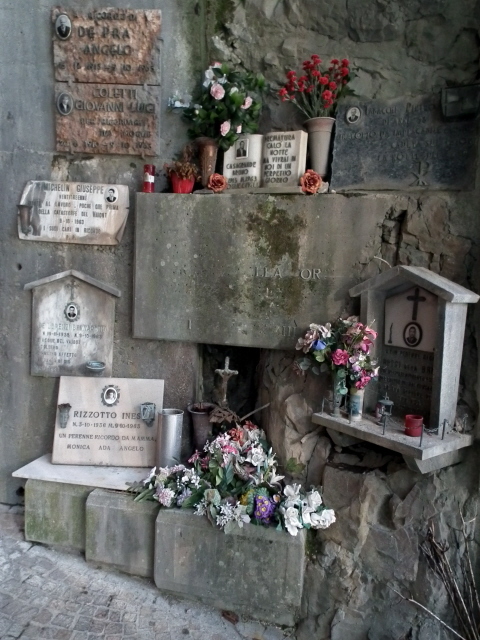 A few miles up the valley, the village of Erto is also worth visiting. In the lower old-town part there are still some ruins to be seen. Other buildings have been restored. But most of the village was newly built higher up the steep slope. 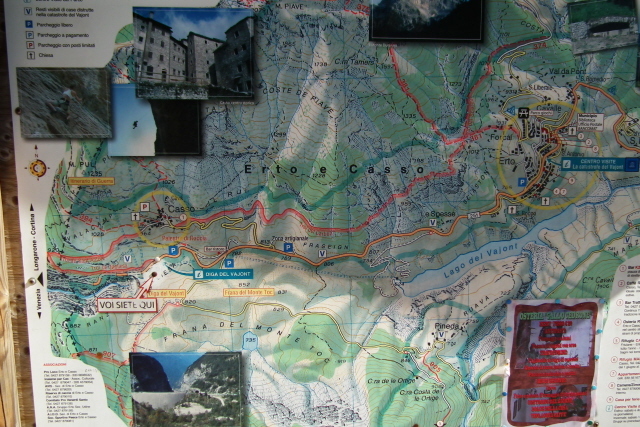 In Erto there is also a visitor centre with an exhibition about the Vajont catastrophe … You can't drive up to it, as there's no access for visitors' cars in the old town, but you can spot the building (a white modern edifice) from the main road leading through (new) Erto. It's probably best to park at the general car park near this road or up in the new town of Erto and walk it. Opening times of the Erto visitor centre: Friday 3.00 p.m. to 7.00 p.m., Saturday and Sunday 10.00 a.m. to noon and 3.00 p.m. to 7.00 p.m.
Every day in peak season in August (in 2010 that was between the 8th and the 22nd). Time required: best to set aside about half a day in total. The tour of the crest of the dam takes ca. 45 mins ... plus waiting time if you just missed the beginning of one. Viewing the dam from the more easily accessible viewpoints will add perhaps another half an hour to 45 minutes. Extra time can be allocated to walking to the bottom of the front of the dam and/or to viewpoints further away. Erto also deserves time, for the old town and the ruins, but also the visitor centre (which may not take all that long unless you can read Italian). Combinations with other dark destinations: none in the vicinity. The nearest point of dark interest would be the Eagle's Nest in Germany, near the Austrian border, about half a day's drive away. Other major dark destinations within Italy itself are even further away. 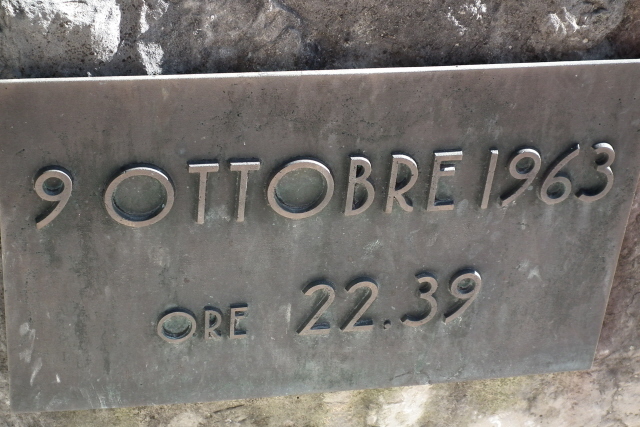 In the area around the Tre Cime (see below) in the heart of the Dolomites, however, there are several historical markers as well as fortification remnants from World War One, when the frontline between Italy and Austria ran right through here, making it the first alpine battlefield of modern warfare. Combinations with non-dark destinations: The scenery around the dam is quite captivating itself, but it gets even more dramatic further to the north-west in the heart of the Dolomites in northern Italy. A particular highlight are the Tre Cime ("three peaks") di Lavaredo, possibly the most picture-book specimens of Dolomite mountains. They are located east of the picturesque lakeside village of Misurina, a one-to-two hours' drive from Longarone.